I have an ever-expanding collection of cookbooks, chef memoirs, food and travel related novels. These hefty volumes used to anchor the bottom rungs of my living room bookshelves, but recently have begun to climb upwards—even threatening to evict my “please-be-in-awe-of-my-intelligence-and-take-me-seriously” foreign policy books. Given my affinity for Asian cuisine, perhaps it’s not surprising that one of my favorite cookbooks is Chef David Chang’s, Momofuku. His recipe for fried chicken is reason enough to buy the book. Brined, steamed, fried and tossed in a spicy, salty, garlicky, gingery vinaigrette, it just might be the best fried chicken I’ve ever cooked or eaten. Unfortunately, making the delectable fried chicken requires a 2-day commitment (there’s the brining, steaming and drying before you ever get to the actual frying part! ), thereby limiting my juicy bird feasts to a few sporadic times a year. However, there are other recipes of note. One of which is the Spicy Pork Sausage & Rice Cakes. 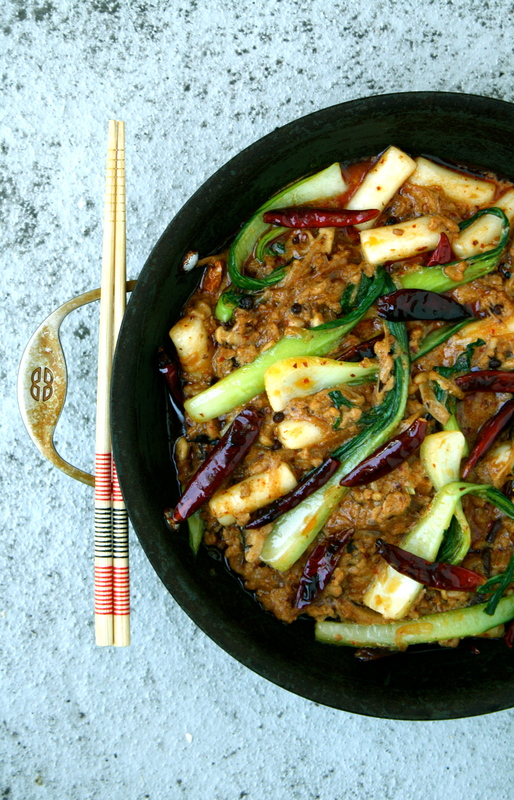 Onions, garlic, Sichuan peppercorns, dried chilies, Chinese fermented bean sauce & spicy Korean chili powder make for a complex and highly addictive dish. As tasty as Chef Chang’s dish is, after a couple times of faithfully following the recipe I began to deviate. In fact I don’t use the recipe any more, rather I use the idea of the dish as inspiration for my own. Each time I riff on the original, simply using whatever I have on hand. Sometimes I’ll use ground pork, the next time bacon (if you use bacon sparingly it won’t overwhelm your dish, just enhance everything with its goodness). This weeks’ version consisted of a shiitake & enoki mushrooms, bok choy, onions, silken tofu, Korean rice sticks and ground pork. 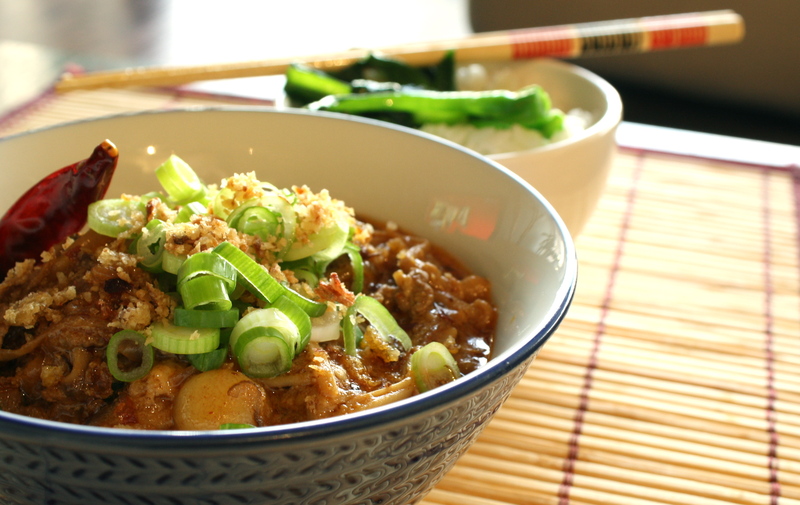 And for a robust vegetarian dish simply cut out the meat completely and colorfully market it as a… Mushroom & Tofu Sichuan Ragù. Heat 1 Tbs. of oil in a large skillet over medium high heat. Add the onions and ½ tsp. of salt. Cook, stirring often until the onions begin to melt and turn translucent, about 5 minutes. Turn the heat down to medium and continue to cook, stirring occasionally, until golden. About 10 minutes longer. While the onions are cooking place another large skillet & 1 Tbs. of oil over high heat. When the oil is lightly smoking add the shiitake, cook for 1 min. Add the enoki and cook 1 minute more or until mushrooms are soft. Remove from the pan and set aside. Return the skillet to the stove. Turn the heat to high and add 1 Tbs. oil. Add the ground pork and ½ tsp. of salt and ¼ tsp. of white pepper. Brown the pork, breaking apart any clumps as you go along. Once the meat is brown, about 1-2 minutes, remove & set aside. Buzz the Sichuan peppercorns in a spice or coffee grinder. Pour 1 Tbs. of oil into the skillet. 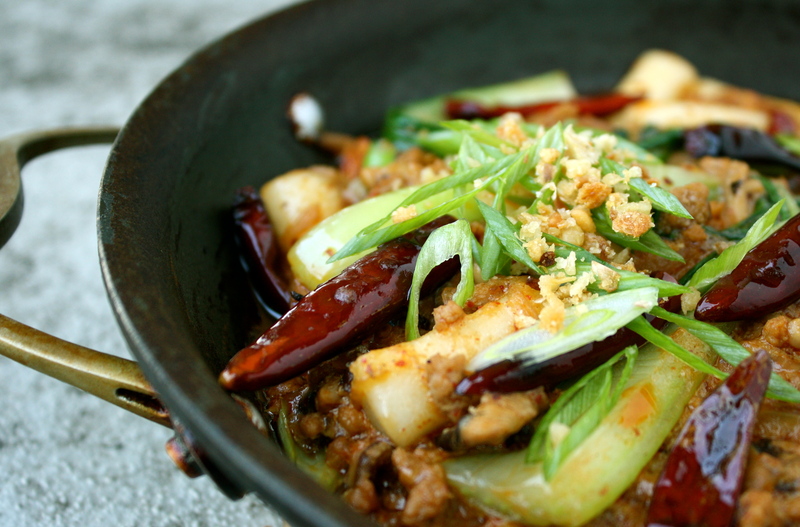 While the oil is still cold add the sliced garlic, dried chilies and ground Sichuan peppercorns. Turn the heat to medium high. When the color of the chilies begins to darken and the garlic becomes fragrant pull the skillet off the heat. Stir in the chili bean sauce & kochukara. Return to the heat. Cook for 30 seconds, stirring quickly. Add the mushroom stock, soy sauce and sugar. Stir. Add the onions, mushrooms, ground pork & sesame oil. Stir through for a quick minute. Remove from the heat. Salt the pot of boiling water generously and add the rice sticks. Cook for 2-3 min. Add the chopped greens. Cook for 30 sec – 1 min. Greens should be slightly wilted but still bright green. Drain. Return the mushroom mixture to the heat. Add the drained rice sticks & Chinese greens. In a separate bowl whisk the tofu until creamy then add it to the mixture on the stove. Stirring through as the ragu returns to a boil. Divide the ragu between 2 bowls. Top with scallions and fried shallots. 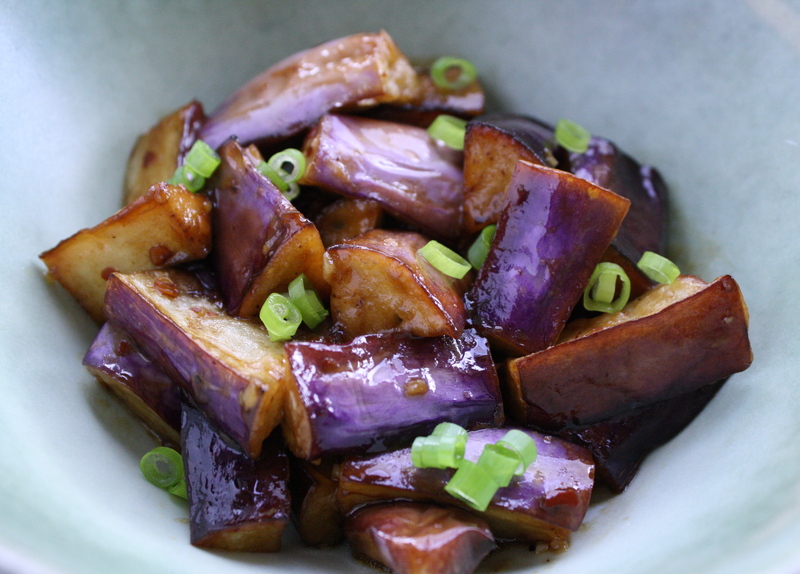 Serve with steamed rice and enjoy immediately. *When you bring home the mushrooms remove the stems from each shiitake cap. 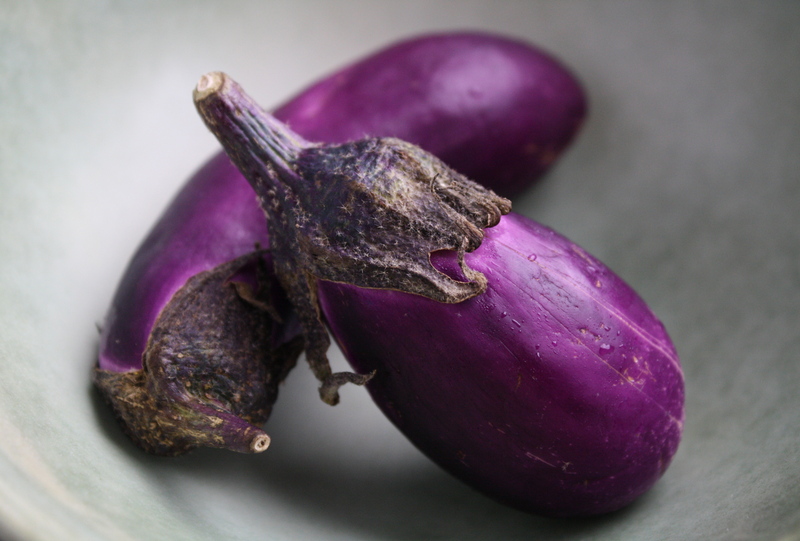 Place them in a small pot with 2 cups of cold water and ½ tsp. salt. Bring to a boil. Turn the heat down and simmer for 30 min. Strain and reserve. **I found kochukara at Super H Mart in VA. It’s incredibly spicy so be careful when adding it to the dish. I knew I’d get at least one request for fried rice when I emailed my siblings asking about their favorite childhood dishes. Sure enough, the following reply came from my older brother, “I would say a proper Chinese/Japanese fried rice is a staple comfort food for me. It’s simple but always takes me back to childhood food”. Disclaimer: I am a HUGE snob when it comes to fried rice, as is my older brother, which is why I understood when he prefaced his choice with the word “proper”. But what is proper Chinese/Japanese fried rice? 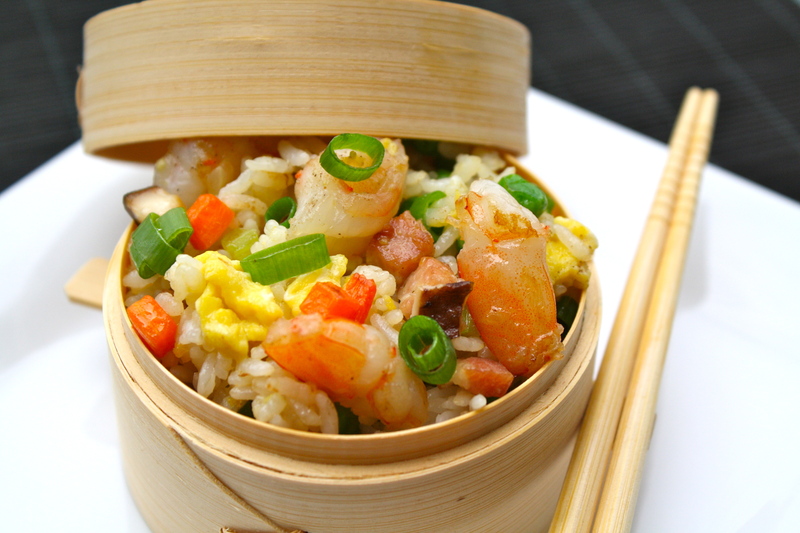 For starters, Japanese fried rice is really Chinese fried rice. I’m not looking to veer off into touchy foreign policy issues here. It’s not an invitation to begin debating Japanese history textbook revisionism or who really owns the Senkaku islands… This is just a simple statement; good Japanese fried rice is really Chinese fried rice. I am willing however, to argue over what goes inside said fried rice. Perhaps it’s best to start with what should NOT be included. There shouldn’t be any chunks of softened pineapple dominating the dish with its sweetness. No bean sprouts poking out like tadpoles from a mound of rice. And no bright green broccoli florets with their promise of nutrition. As for the protein component this is not the time to start defrosting those questionable items in the back on the freezer. The rice shouldn’t be yellow from curry powder, or red from ketchup. And it should definitely not be brown from thickened soy sauce. 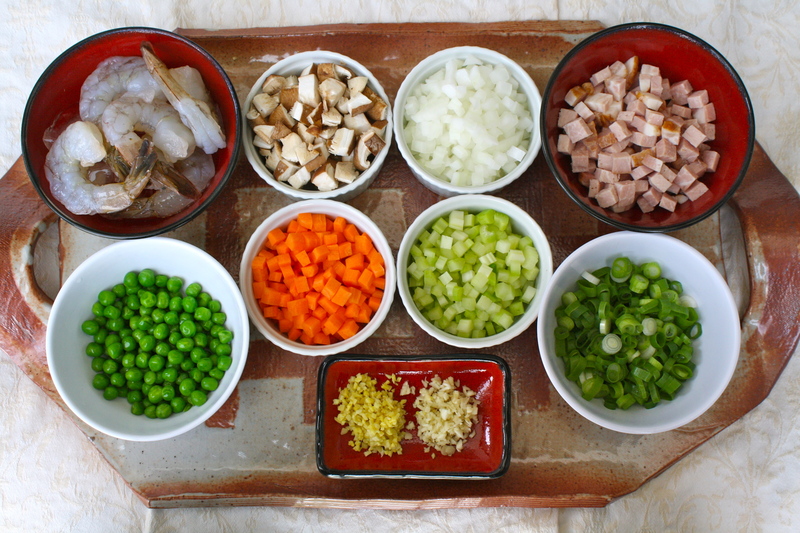 For me the best fried rice is flavored with both shrimp and pork; the rice is still white rather than stained brown from soy sauce, and the vegetables are uniformly cut and cooked. The first really great fried rice I remember eating with my older brother was at the Seagull Hotel in Shanghai when he was six and I was four. We had just travelled with our parents, two-year-old brother and one-month old baby sister by ship, from Japan to China (that’s right, I said SHIP). At the hotel my brother and I would alternate between ordering the fried rice and fried noodles. I’m sure we ordered other dishes as well, but none stuck in my memory like those two big starchy plates of food. Nowadays our massive family has a system for ordering when we go out for Chinese food (imagine the mayhem without one). Two or three of us will scan the menu and call off suggestions for the others to reject or accept, while another sibling furiously scribbles the orders on a scrap of paper. 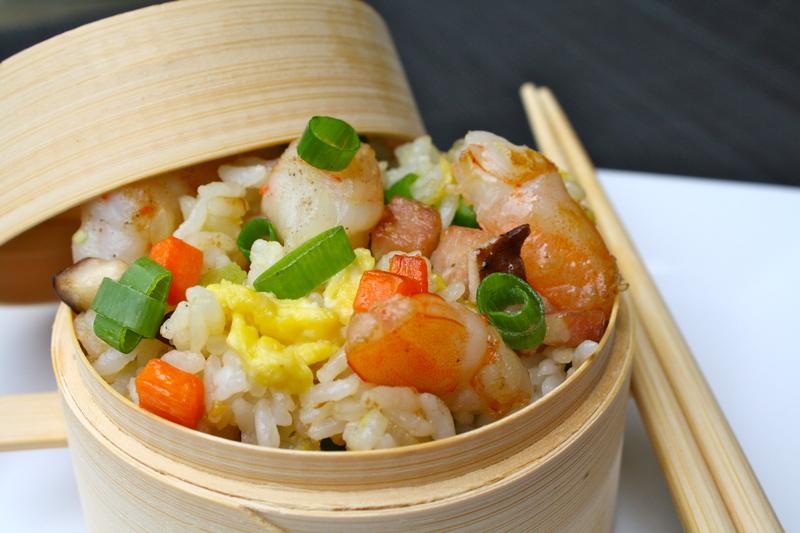 Fried rice with its salty nuggets of ham, just-cooked pink shrimp, and delicately scrabbled eggs always gets a round of head-nods and an enthusiastic “definitely” from the whole family. I’m hoping that the version below gets the same unanimous stamp of approval. *As with all Chinese food timing and speed are the keys to success. Make sure you have everything prepped and ready to go before you turn on the stove. Heat a wok or large skillet and 1 Tbsp. of oil over med-high heat. Once wisps of smoke begin to appear add the diced onion. Cook for 1 min. Add the garlic, ginger and ¼ tsp. of salt. Cook for 1 minute more. Add the diced carrots. Cook for 1 minute. Turn the heat to high. Add the celery and diced shiitake caps. Add 1 tsp. oyster sauce. Cook for 1 min. Add the peas, stirring through. Remove and set aside. In the now empty wok/skillet heat 2 tsp. of oil. Add the diced Canadian bacon or ham (I prefer Canadian bacon for its fat content). Fry quickly over high heat until lightly brown and fat begins to render. Remove. Turn the heat down to medium-high and add the shrimp to the pork fat. Add ¼ tsp. of salt. Cook for 2 minutes, or until shrimp are pink and no longer translucent. Remove shrimp, leaving any remaining fat behind. Turn the heat down to medium and add the lightly beaten eggs to the center of the hot wok/skillet. Cook as you would scrambled eggs for 15 seconds, add the rice to the pan. Mix well with the partially cooked eggs. Sprinkle in 1 tsp. chicken bouillon, ¼ tsp. salt and ¼ tsp. ground white pepper. Continue stir-frying for 1 minute. Add the cooked vegetables, pork and shrimp. Cook for 2 minutes, stirring well to evenly distribute all the ingredients. Add the scallions and sesame oil. Taste and adjust seasoning if necessary. Cook’s note I: To get the best results the rice needs to be cold. Freshly steamed rice is too sticky to fry properly. Use leftover rice or cook it early in the day and let it cool for a while in the refrigerator. Cook’s note II: In an effort to develop a recipe as close to the version my older brother remembers from his childhood I’ve used chicken bouillon. I doubt it comes as a surprise to anyone that this is an ingredient frequently used for seasoning in Chinese food. It received a bad rap for a while due to its MSG content, but these days it’s pretty easy to find a MSG-free version.